JSerra’s football team believes this is the year its program will have a breakthrough and become a playoff contender in the Trinity League. The Lions looked like that kind of team at times against Buena Park in a nonleague game on Friday night at Saddleback College, but at other times their sloppy play and penalties allowed the Coyotes to fight their way back into the game. JSerra running back Casey Eugenio exploded for TD runs of 4, 14 and 40 yards in a 2-minute, 12-second span in the third quarter to bury Buena Park, 52-13. The entire fourth quarter was played with a running clock. “We’re fighting to be one of the best in the (Trinity) League and all of Orange County,” said Eugenio, who finished with 178 yards and four touchdowns on 19 carries. JSerra, which cracked the county top 10 at No. 9 this week for the first time in school history, looked like a playoff contender when Eugenio scored on a 29-yard run on the Lions first drive of the game. Dante Pettis blocked a punt and scored on a 3-yard return and then caught a 33-yard touchdown pass from Nick Robinson to make it 21-0 with 4:01 left in the opening quarter. The Lions slowed down in the second, and the Coyotes seized the opportunity to get back into the game with touchdown runs of 2 and 1 yards by county rushing leader Deven Boston to close the gap to 21-13 at the half. But JSerra’s defense put the clamps on Boston for most of the game, holding him to 57 yards on 13 carries, and Eugenio’s third-quarter eruption finished the Coyotes. Lions coach Jim Hartigan said his team has some things to shore up before league play like the 10 penalties for 105 yards against Buena Park. 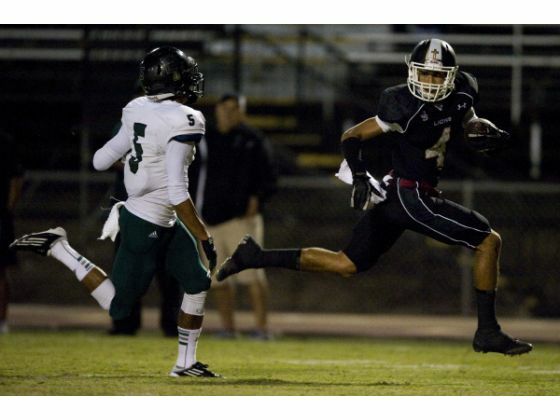 “We can’t get used to that in the Trinity League,” Hartigan said. “We won’t be able to turn it back on in the Trinity League. We have to make sure that we can maintain these leads and make sure that we play solid on defense, stay consistent and there’s some things we need to talk about. For more on the Lions visit JSerra Football on Facebook.